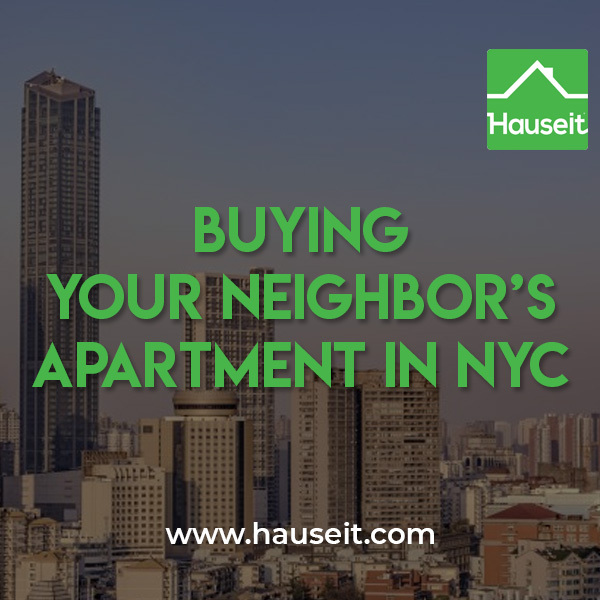 Thinking about buying your neighbor’s apartment in NYC? Do you want to combine your apartment with the one next door? Here’s what you need to know before you approach your neighbor. Can I buy my neighbor’s house in NYC? Why would my neighbor agree to sell his home to me in a direct deal? What are the risks of buying your neighbor’s property in NYC? There is no prohibition against buying your neighbor’s house in NYC. You don’t need a Realtor if you’re lucky enough to have contacted a fellow home owner directly before they’ve signed an Exclusive Right To Sell Listing Agreement and put their home on the market. You will need a real estate lawyer to represent you and review and negotiate the purchase contract on your behalf. Your lawyer will also conduct legal and financial due diligence on your behalf. The process will be slightly different if you’re buying a free-standing house versus a condo or co-op apartment as there won’t be audited building financials, board minutes or an original offering plan for your lawyer to review. Furthermore, if you are buying your neighbor’s house in NYC, it’ll be important to hire a home inspector and to thoroughly review the resulting home inspection report. Since you’ll own the entire building, there won’t be a third party management company that is responsible for the boilers etc. It’ll be entirely your responsibility, so you should make sure the home is inspected before signing a purchase contract. New York City home owners are savvy individuals who will generally understand that selling their home off market in a direct deal will generally be to their disadvantage. That’s because they’ll have no way of knowing where the open market values their home and if they will be able to find a better offer than yours. Essentially, by selling their home to you directly without first testing the market, they’ll be transacting in a vacuum. When would it make sense for my neighbor to sell his home to me directly? Your neighbor will be more open to a direct deal if there have been recent sales in your building, ideally of the same line and a similar floor to your neighbor’s home. Especially if the recent sale comps have been high, your neighbor might be tempted to agree to a direct deal at a similar price per square foot (“PPSF”) valuation. A sale at the same valuation as the highest recent recorded sale in the building would make sense for your neighbor especially if he had special insight into the sale process. For example, if he knows that it took a long time to sell the property (i.e. over 90 days on market) and the ultimate buyer had to stretch with only a 10% down payment, he might believe that it’ll be great if he can get you the pay the same PPSF for his home as it’ll be tough to find a similar buyer on the open market. What’s my neighbor’s advantage in doing a direct deal with me? The major advantage for your neighbor in selling his home directly to you is reduced closing costs. By doing a direct deal, your neighbor is able to avoid paying the typical real estate commission to sell of 6% of the sales price. This is significant in terms of savings and can really make sense if he’s able to get you to pay the same valuation as the highest, recent recorded sale in the building. Another advantage of doing a deal directly with you is the ability to avoid inexperienced or plain bad real estate agents in NYC who might clumsily miscommunicate or otherwise cause a deal to fall apart. If your seller is a good negotiator, he’ll at least feel good about being able to deal with the buyer directly. One of the major risks of buying your neighbor’s property in NYC, especially if it is an adjacent property which you intend to combine with your existing apartment, is that the layout will be unnatural or awkward for the new combined apartment and that the maintenance might become higher than normal. For example, if you combine two adjacent 1 bedroom apartments into a 3 bedroom apartment, you might not get the same valuation as other 3 bedrooms in your building with more natural layouts. This is something to be especially careful of if the only way to connect the apartments is through a narrow shared wall. This living arrangement won’t be as smooth as an apartment that was originally designed to be a 3 bedroom and thus won’t enjoy as high of a valuation. Another risk of combining apartments in NYC is that you may not end up with as many legal bedrooms as you intended. Maintenance and common charges are typically allocated fairly among apartments according to variables such as square footage, how high of a floor it’s on etc. However, there is a risk that the maintenance charges for a combined apartment will be “out of whack” and higher than a regular 3 bedroom in the building. You should investigate this before proceeding with a purchase by checking with your building management company and/or board. What about the risk of overpaying for my neighbor’s apartment in NYC? While there will always be a risk of you overpaying, the risk of doing an off market transaction is much greater for the seller because generally demand in a premium market like NYC vastly outstrips supply. That’s because once a property is listed on the RLS (i.e NYC’s version of the Multiple Listing Service) and syndicated to popular real estate search websites like Brownstoner, every buyer and buyer’s agent will know about the property. And once it’s on the market, the seller will quickly get an idea of where market demand is at his or her listing price. If the property is listed at a reasonable price, or even slightly under-priced, there will be hordes of buyers clamoring to see it and multiple offers leading to a best and final. If it’s over-priced, the seller will hear crickets and only receive the occasional inquiry to see the property, most likely for comparison shopping. Therefore, the lack of market transparency is generally to your advantage as the buyer. There’s a much greater chance that the seller doesn’t know how much he or she can get for their property in the current market versus you paying too much. Many New Yorkers have a habit of not speaking or even acknowledging their neighbors. This aloofness is a mistake, especially when you’ll eventually need their help. You should start by being friendly with all of your neighbors. No need to go overboard, but definitely go out of your way to say hi in the elevator or other common areas. They’ll be much more likely to engage you in direct sale negotiations if they have a positive impression of you. After you’ve gotten to know your neighbor, casually bring up the fact that you were thinking on selling in order to upgrade to a larger apartment. Perhaps mention that you were thinking about combining apartments with another neighbor (i.e. different from the one you are speaking with), but decided against it because it wasn’t the perfect fit. Then perhaps use that opportunity to ask your neighbor for advice on what he thinks the property market is like. This casual inquiry will give you valuable insight into how familiar your neighbor is with the current real estate market. If you’re lucky, your neighbor bought the apartment 30 years ago and has no idea how valuable it is today! After ending this conversation innocently, your neighbor will definitely start thinking about the possibility of selling to you directly if he or she had been thinking about moving. You’ve just planted the seed of a direct sale into your neighbor’s mind! If this casual approach doesn’t work, you can always be more direct at a later date and bring up the possibility of doing a direct deal next time you run into them. Mention that you’ve looked a little online, but because you’re so busy you’d prefer to just do a quick deal with your neighbor. Suggest a price or better yet, ask your neighbor what he thinks he would sell it for!